This website was created in 2005 to document our family history. One of the biggest mysteries was the source of our great grandfather George Musgrove's wealth. He inherited £12,000 (valued today at several million pounds!) and lived off this money for rest of his life. Since researching the family history there were no clues as to where George acquired this fortune. Even members of the family in laters years were not aware of the monies origin. This has remained a mystery for almost 150 years until now. We have now identified where the money came from, and can reveal (after extensive reseach and a bit of luck) that the story starts back in 1841 when Christiana Aitchison was employed as a domestic servant to the Musgrave family of Gordon Square London. 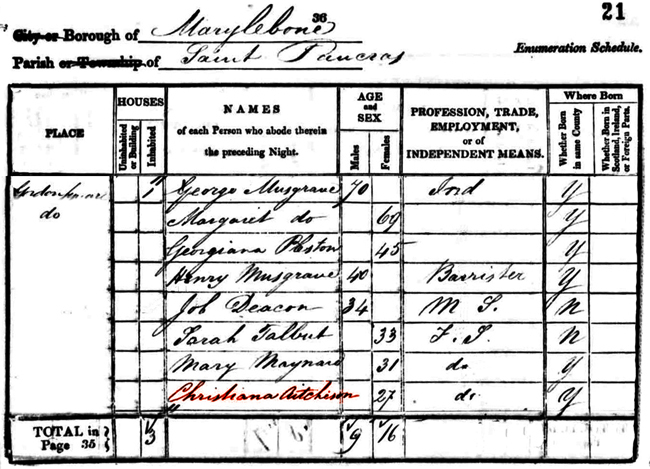 The above census from 1841 for 6 Gordon Square Marylebone lists the Musgrave family who comprised of George and Margaret Musgrave, and their children Georgiana Plestow (now a widow), and Henry Musgrave, a Barrister. One of the servants is Christiana Aitchison who becomes the central character in this story. Missing from the above census is George and Margaret's youngest son Thomas Musgrave who is to feature as the key to this mystery. Two years later Thomas Musgrave married Chistiana Aitchison at St Lukes Chelsea. The marriage certificate shows his surname as Musgrove but a recently discovered church original certificate tells a different story. On the left you can see the original crossing outs on the right is the photoshop retouched image. The certificate above shows extra details in the left hand margin that are not on other copies. These amended parts of the certificate are not dated and they were later crossed out for reasons unknown. The deleted notes state that the name Thomas Musgrove should be changed to Thomas Musgrave, his profession changed from colorman to Gent, and his father's name changed from Thomas Musgrove to George Musgrave. Thomas and Christian's first child Christiana Margaret Jannette Musgrove was born 5th April at Christiana's parents home, 5 Princes Street St Pancras. The certificate below shows Thomas's occupation as Painter and confirms his surname as Musgrove rather than Musgrave. The documentation concerning the child Christiana in 1843 is one of the important links in solving this mystery. The birth certificate above confirms she was born 5th April and the was registered 27th April. Christiana was then baptised November 5th 1843, exactly 7 months from her birth. The baptism certificate below (taken from original church records of the Parish of St Pancras) shows the father as Thomas Musgrove, artist, and confirms the birth was on April 5th 1843. A recently discovered document has confirmed that the Thomes Musgrove on the above certificates was infact Thomas Musgrave son of a wealthy family in nearby Gordon Square. Thomas's full name was Thomas Musgrave Musgrave and he was born in 1803 at Shillington Manor Bedfordshire, the family's country seat. 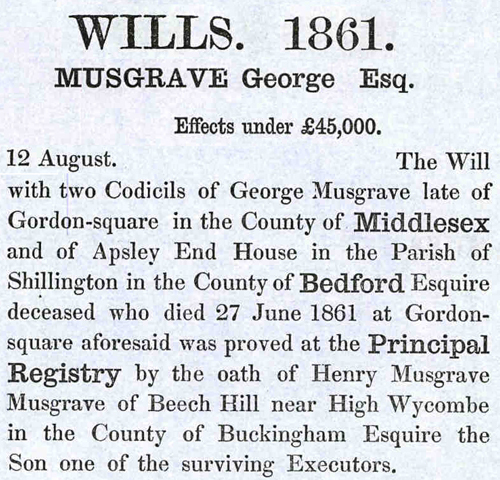 His brothers George and Henry also had Musgrave as a middle name as well as a surname. The document below is also from the St Pancras Church Baptism records for 1843. It shows that at the bottom of the page for Baptism registered on the 9th April someone has added details at a later date. Squeezed between the entry for Charles Winton and the foot of the page is a margin note that confirms Thomas Musgrove's true identity. This additional Baptism entry would appear to have been added years later. Probably to legally confirm the link between Christiana and her father. This later entry confirms Christiana's parents as Thomas M and Christiana Musgrave of Princes Street. His status is shown as Gentleman. It appears Thomas Musgrave Musgrave got one of the domestic servants pregnant at his parents home in Gordon Square Marylebone. He married her one month before the birth of their child in 1843. The couple were now living in Chelsea which would suggest that he was estranged from his family at this time because they didn't approve of their son's marriage to Christiana, a domestic servant. Thomas and Christiana's second child Elizabeth Musgrove was born at Queen Charlotte Lying In Hospital Marylebone on 7th November and the birth was registered on 10th December. Thomas's occupation is shown as Oilman (artist). His surname is still Musgrove, suggesting that he is still estranged from the Musgrave family. Elizabeth Musgrove was baptised 16th February 1850 at St Pancras. 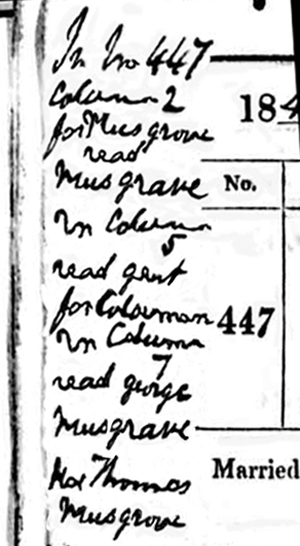 The baptism register above shows the parents as Thomas & Christiana Musgrove of Tonbridge Place (Euston Road). His occupation is shown as Painter. Elizabeth Musgrove died wiyhin 7 months and she was buried 25th February 1850. The Musgroves had now moved to Tonbridge Street. Interestingly a Coroner's Inquest was held on Elizabeth's death which would not probable have happened if the child was not from a wealthy family. The above map dates from 1827 and shows both Tonbridge Place and Tonbridge Street in relation to Gordon Square. By the time of the March 1851 census Thomas and Christiana Musgrove are living apart. Christiana is living with her parents George and Margaret Aitchison in Princes Street and Thomas has returned to the Musgraves in Gordon Square.. The above 1851 census for 5 Princes Street lists Christiana at her parents home with her Daughter Christiana, now aged 7 and her cousin George Aitchison. Her surname is incorrectly shown as Thomas and her marriage status is still married. Below is the 1851 census for 6 Gordon Square, London home of the Musgrave family but incorrectly shown as Musgrove due to a spelling error by the census enumerator. Thomas is listed as living back with his parents George & Margaret Musgrave. He is now aged 45 but his marital status is declared as being unmarried. Thomas's wife Christiana died of Consumption aged just 35 at her parents home, 5 Princes Street St Pancras. The certificate above shows her father George Aitchison was present at her death. She is described as the wife of Thomas Musgrove, Gentleman. It would appear that Thomas and Christiana were still living apart but still married. Christiana was buried 25th June 1851 at St Martin in the fields. On 18th September six year old George Aitchison was baptised George Aitchison Musgrove at St Pancras old Church. This was exactly 3 months after the death of Christiana. 10 years later when the 1861 census was taken Thomas Musgrove has now assumed his original name of Musgrave and is living with his 92 year old widowed father George Musgrave. 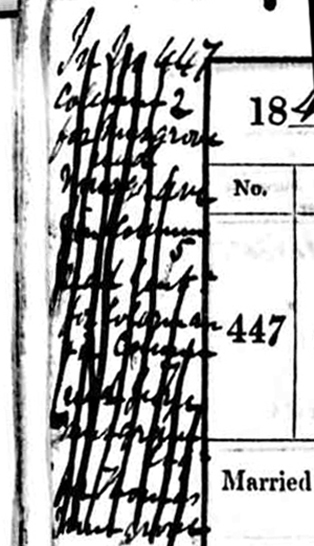 The above census for 6 Gordon Square shows father and son, although Thomas is shown incorrectly as George's brother. Thomas is now aged 58. 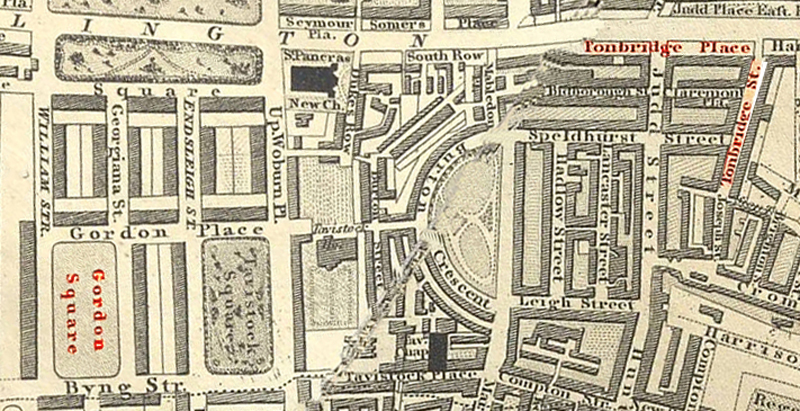 Thomas Musgrave's father George died 27th June 1861 at Gordon Square. He had made several wills in his long lifetime, the last being in 1858. Above is just a small extract from his six page Will. Apart from leaving effects valued at £45,000 he left various amounts to his children, namely Geogiana Plestow, his sons George Musgrave Musgrave, Henry Musgrave Musgrave, and Thomas Musgrave Musgrave. There are also trust funds established but by the nature of the writing of the Will much is difficult to decipher. We have highlighted an extract above where it can be seen that a provision for a trust fund for all the children of Thomas Musgrave Musgrave who shall attain the age of 21 years of age. Because Thomas only had one child, namely Christiana who was born in 1843. She would be legally entitled to receive the money held in trust in 1864 upon reaching the age of 21. Above is the certificate of Thomas Musgrave Musgrave's marriage to his second wife Jane Preston. They married at All Saints Parish Church Gordon Square Marylebone. Thomas declares he is a Widower and a Gentleman. This is the first time that Thomas Musgrave has acknowledged that he was previously married. Remember he had always used the surname of Musgrove during his marriage to his first wife Christiana. After his marriage in 1861 Thomas Musgrave Musgrave lived with his wife Jane at 32 Regents Park in London. The house is shown present day below. 32 is the house with the blue door. Thomas Musgrave Musgrave's only daughter Christiana had been brought up by the Aitchison Family. In 1861 she was living with her grandfather George Aitchison but after his death in 1864 her uncle and aunt Henry and Jessie Cole moved into the family house where she was living at 5 Princes Street St Pancras. This address had become 102 Whitfield Street by 1867 when Christiana had a baby by her cousin George Musgrove who was living in the same house. The certificate above shows the father as George Aitchison rather than Musgrove. The mother is shown as Christiana Aitchison formerly Musgrave. This implies that she was married to George but she wasn't. However this confirms that her maiden name was Musgrave. The baby's name was Christiana Jessie Aitchison but she was baptised Christiana Jessie Musgrove 3rd November 1869 following her parent's marriage. Above is the certificate of Christiana Musgrave's marriage to the father of her child born in 1867. She married June 26th 1869 George Musgrove (previously Aitchison) in St Pancras. Thomas and Jane's marriage ended in divorce at the beginning of 1869. 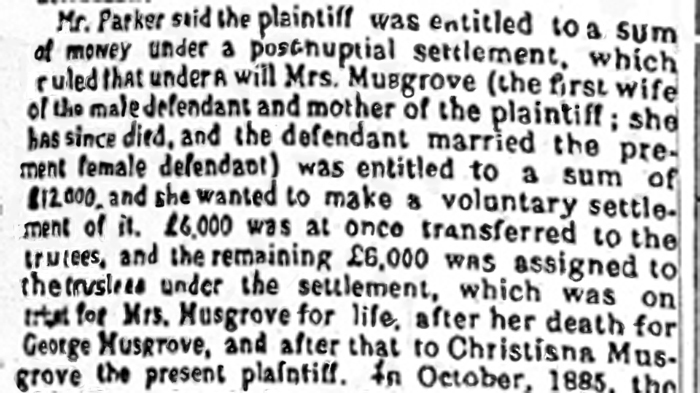 Jane Musgrave as the Petitioner sought a divorce from her husband, the Respondent on the grounds of desertion, and failing to honour her conjugal rights. In his defence Thomas stated that due to ill heath he had moved to Brighton as he was fearful of living with Jane due to her frequent bouts of temper and violence towards him. The court summaries from both Jane Musgrave and her husband Thomas Musgrave Musgrave explain their individual versions. 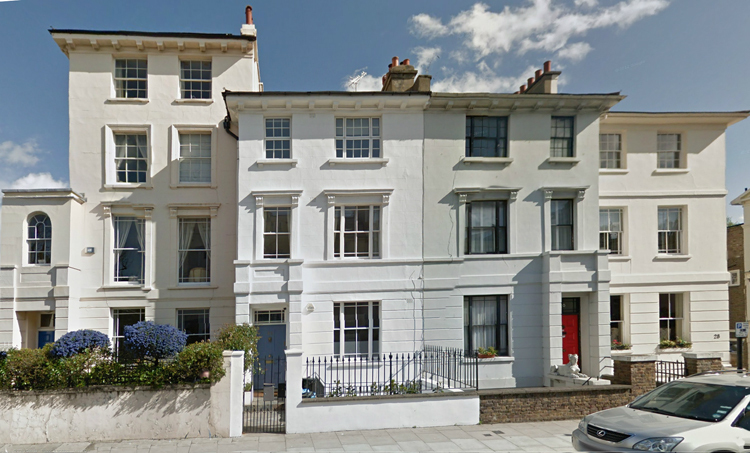 For health reasons he moved down to Brighton and lived with a family in Waterloo Place near the town centre. He died here 14th August 1869. He left a Will bequeathing his property and effects to his ex-wife Jane. There is no mention of anything for his only surviving daughter Christiana who would now be 26 years old. Below is the baptism certificate for George and Christiana's daughter Christiana Jessie. When she was born on 11th October 1867 her surname was registered as Aitchison. It was probably thought necessary that when she was baptised she would be correctly named as she would be entitled to a percentage of the trust fund set up for her mother when she reached adulthood at 21. Below is the Death certificate of Christiana Margaret Jannette Musgrove who died suddenly in September 1871. After her death under the terms of the trust fund set up by the Musgrave family, her inheritance would pass upon her death to her husband, and then upon his death to their daughter Christiana. The above information confirms without any question of doubt the true identity of Thomas Musgrove, and the source of George Musgrove's wealth. The critical documents that confirm this are the 2nd Baptism entry for Christiana in 1843 held in the St Pancras Church Records.These show Thomas M Musgrave as the father. On the certificate of his 2nd marriage in 1861 he states he is a widower, yet there are no records of Thomas M Musgrave ever being married before. This is because when he first married he used the name Musgrove to distance himself from his family. His declaration of being a widower was correct, but remember as Christiana died ten years before in 1851 he could have stated he was single. George Musgrove became a wealthy man due to a series events. In 1864 he moves into the same house as his cousin Christiana. He was now 19 and she was 21 and just inheriting the trust fund money. Within 3 years she was pregnant with George's child. In 1869 they marry in St Pancras but soon move to Kennington where their child Christiana is baptised. The family remain her until George's wife dies, and under the terms of the Trust George inherits. Many years later in 1887 George Musgrove's daughter Christiana now aged 20 had recently married Thomas Langman, a farmers son in Danbury Essex. There was a falling out between the 2 families which resulted in the matter being taken to Court. Essentially this was over the distribution of the remaining Trust money. Below is an extract from one of the newspaper reports of the case. It is ironic that the Musgrave blood line from Thomas and Christiana only continues with the Langman family. The Musgrove name was based on pure invention. George Musgrove's wealth which benefited both him and his family for forty years was purely inherited through his marriage to his first wife Christiana.